Prepare for Your M-Class License Test - These Motorcycle Cheat Sheets Can HELP! 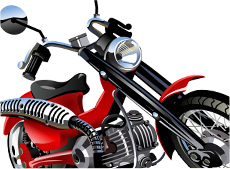 Are you in the process of getting your learner's permit or motorcycle license? If so, our Motorcycle Test Cheat Sheet is for you. This easy-to-use, convenient, and comprehensive resource includes everything that you need to get your permit, and nothing else. Why waste time with bloated rule books and manuals when you can have all of the answers you're looking for right at your fingertips? 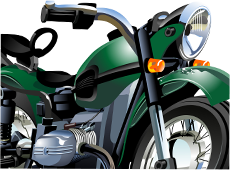 Before you can get your learner's permit, you will first have to take a written test that covers various traffic laws and rules that specifically relate to motorcycles. Passing this test can be difficult and you should study to help ensure that you are fully prepared. One way of studying for this test is browsing through your state's official motorcycle manual, but be prepared to be buried in content. Unfortunately, the very thing that makes official motorcycle manuals comprehensive resources - their abundant content - also make them not very helpful. Our motorcycle test cheat sheet and practice tests are better solutions - they are convenient and user-friendly! With our practice tests and cheat sheets, DMV exams are a worry-free affair. In fact, we are so confident in our motorcycle test cheat sheet that we are certain you'll see results. If you are considering using our cheat sheets for your DMV test, you're probably asking yourself, "Well, how does it work?" The answer is actually quite simple. 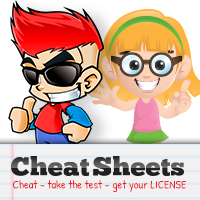 We have cheat sheets for every type of license and every single state. Once you select your license type and state, you'll be given login information that allows you to access the cheat sheet of your choice through our website. Once logged in, you can pull this cheat sheet up in PDF format on your computer, smartphone, or tablet device. It can be used for practice or as a quick-reference guide during your test. Our motorcycle test cheat sheet has all of the information that you need to pass your written test and nothing more. You don't have to worry about digging through pages and pages of content to find the answer you're looking for. Our cheat sheets do not have the actual answers to your test though, as every DMV test is different. Rather, they have the information needed to answer the questions correctly. So in essence, you're "cheating" without actually cheating. Take your smartphone with you to your written test and the answers are never more than a quick glance away. Not the Kind of Cheat Sheet You Need? We also offer our DMV Test Cheat Sheetsfor automobile and commercial licenses.